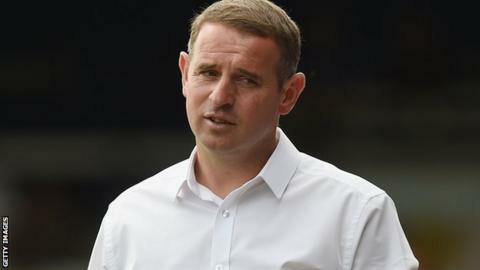 Dave Robertson believes pressure from Peterborough United's fans on social media was a contributory factor in his dismissal as the club's manager. Robertson, 41, was sacked after Saturday's 2-1 loss at Southend, which left them 20th in League One. "I can see the pressure the chairman's under, particularly from a group of fans on Twitter," Robertson said. "The chairman will only make decisions in the best interests of the football club and this is one he had to make." Posh were beaten in four of their first six league fixtures, as well as losing to Millwall in the Football League Trophy and Charlton in the second round of the League Cup. "At the end of the day, we are in a results business," Robertson told BBC Radio Cambridgeshire. "Unfortunately results haven't been coming recently, although the performances have shown signs. "I don't think it's the end for this team. The team can go on and do good things if they work hard enough, and have the mentality they need to be successful." Robertson signed a three-year deal in May, having been caretaker-manager following Darren Ferguson's departure in February. It was the first time the former Royal Marine had been in charge of a first team having previously served as Posh's academy manager. Robertson added: "It's disappointing for me on a personal level, but the one thing that I did say to the chairman is that when I wake up in the morning, I can look at myself in the mirror and know that I have given 100% of everything I've got morning, noon and night and worked my socks off to do everything I can for this football club."